This is a darkly glinting novel set on Ireland’s Atlantic coast, The Green Road is a story of fracture and family, selfishness and compassion - a book about the gaps in the human heart and how we learn to fill them. Anne Enright is addicted to the truth of things. Sentence by sentence, there are few writers alive who can invest the language with such torque and gleam, such wit and longing - who can write dialogue that speaks itself aloud, who can show us the million splinters of her characters' lives then pull them back up together again, into a perfect glass. The latest novel from Man Booker Prize-winning author Anne Enright is a gorgeously raw and expansive examination of the Madigan family. 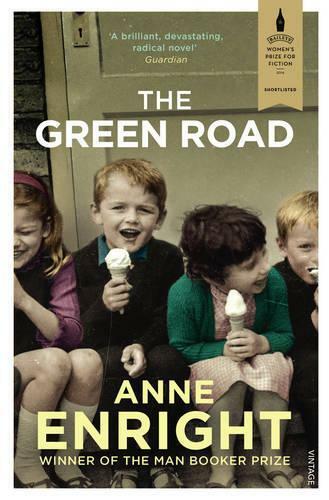 Sprawling thirty years, The Green Road follows the four children as they leave their childhood home on Ireland’s Atlantic coast for new lives and new countries. Years later, when their mother Rosaleen decides to sell the home, the family return for a last Christmas. I first came across Enright’s work at university and I credit her with prompting my ongoing love affair with contemporary Irish fiction. These authors are often remembered for being bleak and beautiful, and Enright’s writing is certainly both. In The Green Road, the Madigans are engaged in personal struggles that are at once intimate and universal: one daughter has a child and a drinking problem; one son struggles to come to terms with his homosexuality amid the AIDS crisis of the 1980s and 1990s in New York. Yet there is a brashness in Enright’s writing that sets her apart from my other favourite Irish authors (such as Colm Tóibín and Sebastian Barry) and she has a special place on my bookshelf. Enright’s portrayal of a big family is perfectly pitched as she renders the ebbs and flows of their dynamics – their betrayals and grudges, their love – in sharp detail. In her understanding of her characters’ failings she is both piercing and generous, while in her depictions of the tiny moments that make up their lives she is both arch and melancholic. As the Madigans’ lives break apart and come together, Enright moves between their different perspectives (in the second half of the book, she sometimes does this within a single paragraph) and bypasses years with a single page turn. This structure creates a sense of breathless urgency. You can’t help but feel that you too are in the thick of it with the family. Enright was appointed Ireland’s very first Fiction Laureate earlier this year and The Green Road is a testament to the wisdom of this decision. Shortlisted for the Man Booker Prize 2015 A Little Life by Hanya Yanagihara is an immensely powerful and heartbreaking novel of brotherly love and the limits of human endurance.